Roberto Blake is an entrepreneur, author and speaker how has mastered the art of story telling through video. Video is a powerful medium which humanizes your brand and personalizes who you are. 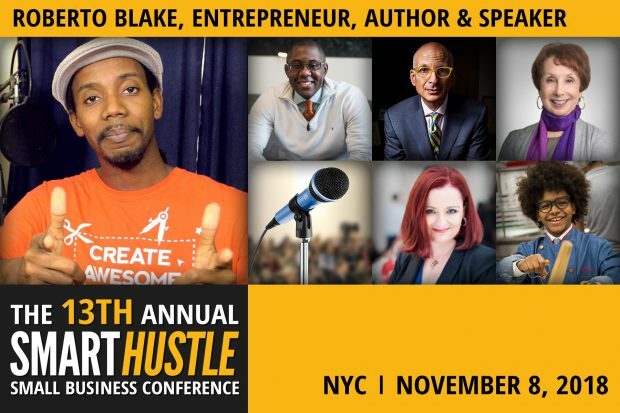 We're excited that Roberto is going to share his insights on how to use video to grow your business, at the Seth Godin Mastermind taking place at the 13th Annual Smart Hustle Small Business Conference in New York City on Thursday, 8 November 2018. Robert is an in demand YouTube celebrity who helps clients tell their stories using video. He is a Creative Entrepreneur helping businesses, brands and individuals market themselves effectively with engaging visuals and effective messages. Roberto has over 10 years of experience commercially in design and marketing and has helped brands, both large and small achieve their goals and reach their audiences. His work has been recognized by Forbes, Huffington Post, Adobe and Photoshop Creative Magazines.